Firefighters trying to keep blazes from spreading throughout the Los Angeles area are now facing hurricane-force winds in addition to flames. At least four major fires had engulfed large tracts of land in the metro area’s north and west, with the Thomas Fire reaching 90,000 acres by Thursday morning. It is only 5% contained, according to Cal Fire authorities, with tempered hopes for progress throughout the day given a surge in the Santa Ana Winds. The winds are expected to reach 80 mph, roughly equivalent to a Category 1 hurricane, and Cal Fire said that there was an “extreme” increase in fire potential stretching south towards San Diego. The fires forced thousands of residents to evacuate their homes around Los Angeles and in suburbs throughout the region. Downtown Santa Paula was darkened by a power outage as strong winds pushed the Thomas Fire across thousands of acres. 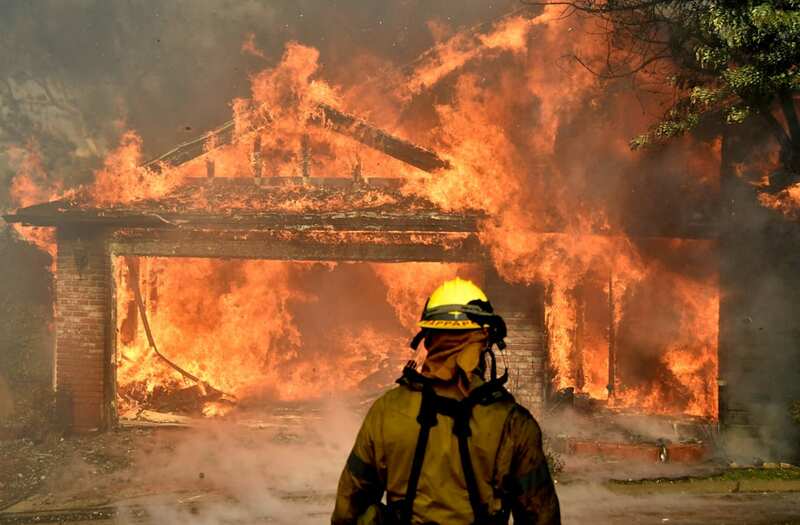 The fire continues to threaten homes as it burns along the 101 freeway. 101 remains open, but authorities are advising people to avoid driving there. The burned remains of cars lined a country road near Santa Paula. Embers blew from a tree shortly before it fell near burned cars in Santa Paula. Despite the violence of these images, no fatalities from the fires had been reported as of 2pm PT on Wednesday. The fires destroyed over 150 structures and are threatening thousands more homes as of Wednesday afternoon. Emergency crews blocked roadways in Ventura on Wednesday. Ventura was hit hard by the Thomas fire, the first and largest of the blazes. The remains of a home are seen here after it burned to the ground. Entire neighborhoods in Ventura were leveled. In the early morning on Tuesday, the Creek Fire broke out in the Kagel Canyon area in the San Fernando Valley, north of Los Angeles. A local man was seen praying on Wednesday morning near the Creek Fire in Sylmar. Thousands of firefighters are working to contain the blazes. But the fires showed no signs of stopping on Wednesday afternoon. Dry, gusty Santa Ana winds continue to blow across the region. About 150 homes have been destroyed so far because of the Thomas Fire in Ventura County, with others such as the Skirball Fire closer to Los Angeles also destroying structures in the Bel-Air neighborhood. LAFD Deputy Chief Chuck Butler said that more than 45,000 people had been evacuated because of that blaze, part of what Los Angeles Mayor Eric Garcetti said were 150,000 people forced from their homes. The Santa Anas, a yearly phenomenon in the region, have this year come after a particularly dry autumn, which created a tinder box that has now been set alight. Erin Mellon, a spokeswoman for the California Department of Water Resources, said that climate change is believed to have influenced the recent cycle of droughts and record rainfall.